From the very beginning World Migratory Bird Day has been a tremendous success worldwide. Each year since 2006, the total number of registered WMBD events has steadily increased along with the number of countries in which WMBD celebrations have taken place. In 2011 alone, a total of 211 registered events took place in 64 different countries - every single one is unique in its own way and as diverse and creative as the people and organisations involved. WMBD activities take place in many different places, both indoors and outdoors. Schools, parks, town halls, education centres and nature reserves are all places where events have been hosted in the past. These can vary from birdwatching tours and educational workshops to dramas, festivals, exhibitions, painting competitions and other awareness raising activities. 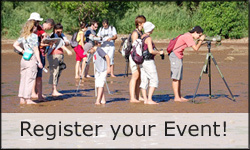 Events organised to mark World Migratory Bird Day usually take place on the second weekend of May. United by a common theme and campaign, WMBD events have taken place in all corners of the world and have involved and inspired hundreds, if not thousands of people of all ages. To help you get some ideas for your own upcoming WMBD 2012 event, we have picked out a few past events which we would like to share with you. While this is only a small selection from a long list of exciting events which have been registered on the WMBD website over the past years, we hope that these examples will inspire you to get involved in WMBD this year and help you plan your own unique WMBD event for the weekend of 12-13 May 2012. The central launching event of the very first World Migratory Bird Day in 2006, named ‘WINGS’, took place on the edge of the Great Rift Valley in Kenya. This impressive artistic show reflected the symbolic value of birds and their historic and cultural significance. More than 200 representatives from all over the world as well as artists from Turkey, India, Peru, Italy, Kenya, Germany and the USA joined this magnificent event. During WMDB in 2007 several activities were organised especially for schoolchildren in Ladakh, India. On 12 May 2007 a drawing and painting competition was organised on the theme “Migratory Birds in a Changing Climate”, and on 13 May 2007 a symposium on “Climate Change Impact on Migratory Birds” took place. In addition to these activities, a poster produced specifically for the event was released on that weekend. For WMBD 2008, the Malaysian Nature Society Miri Branch invited the bird photographer and birdwatching specialist Choo Tse Chien to Miri. Over the course of 4 days, the special guest gave presentations on migratory birds with a particular focus on the avian biodiversity of Malaysia. He also revealed some secrets of bird photography and led birdwatching trips. The events targeted pupils and the general public. The audience had a chance to see a professional at work and obtain a true birdwatching experience. The International Wadden Sea School provided children with the opportunity to play the "Wader Migration Game", a "2 hour educational activity", designed to inform children about migratory birds and the Wadden Sea ecosystem as a stop-over site on the East-Atlantic Flyway. In the role of a wader chick, the children experienced the adventure of migration and discovered the importance of undisturbed feeding and resting grounds along the flyway. Birdwatching activities completed the programme. Every participant received a "logbook" of the journey to take home. In 2009 BirdLife Botswana organised a drama and poetry competition for school children in the Gaborone area. The children wrote their plays or poems under the guidance of their environmental teachers and then performed them in front of judges. The plays and poems included references to barriers to migration and hunting. This event raised awareness on migratory birds and spread information among the children and the community. For WMBD 2009 the Armenian Society for the Protection of Birds organised a presentation and a birdwatching trip for school children as well as a “bird migration role play”, which helped to understand the barriers that birds have to face on their journeys. The National Museum of Nature in Yerevan launched the WMBD 2009 with the WMBD trailer, a presentation of the “Barriers on migration” and a “Yes or No - quiz show”. This meeting was broadcast on the two leading national TV channels. As in former years, WMBD activities were organised by the Association "Les Amis des Oiseaux" (AAO), the BirdLife Partner in Tunisia, from April to May 2010. The celebrations included a National Bird Migration Camp at the Important Bird Area (IBA) Jebel El Haouaria (also known as Jebel Sidi Abiod), drawing competitions for children, lectures, field trips to the Jebel Touati Nature Reserve in the Governorate of Kairouan (Central Tunisia) and many other raising awareness activities. On 9 May 2010, the Dian Fossey Gorilla Fund International in collaboration with the Tropical Biology Association (TBA), organised a bird watching programme. As part of the event, KRC and TBA-Rwanda joined the Environment Club of Musanze High School, where more than 40 birders and enthusiasts gathered. The importance of birds in general and migratory birds in particular were highlighted and what can be done for the protection of their habitats and the threats they are facing. 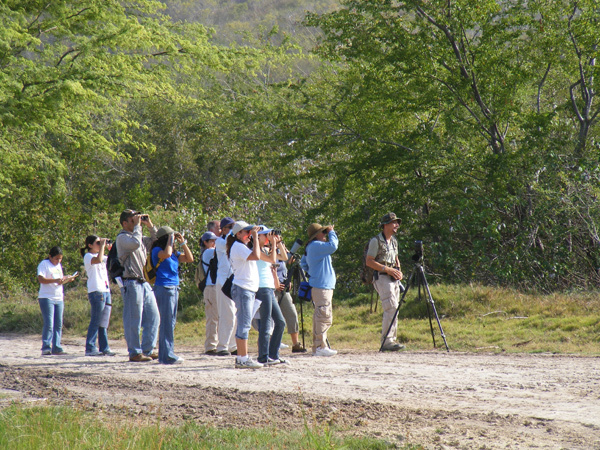 Participants were then invited to take part in a two-hour bird-watching excursion during which 35 different kinds of birds were recorded – mainly flycatchers and sunbirds. The topography and climate of Pakistan's province Baluchistan has a great attraction to migratory birds coming from the freezing Central Asian Republic and Siberia. Within this area the Nag Rakshan Valley provides the favorite food for the Houbara Bustard, which is one of the birds that migrate to Pakistan. Due to lack of other energy resources the plants are also used as firewood by local communities, which brought the Houbara Bustard close to extinction. On 8 May 2010 the Houbara Protection Organization (HPO) has organised a walk to raise awareness among the communities of Nag Rakshan Valley and to force the protection of this rare bird. Since 2007, birdwatching and educational activities in Puerto Rico have been organized to celebrate World Migratory Bird Day. Visits to the Rio Abajo Forest, public and private school events and participation in the Caribbean Endemic Bird Festival have all helped raise awareness about the threats to migratory birds. Organizers hoped to promote awareness about the subtropical humid forests and habitat for birds such as the Puerto Rican Parrot and a subspecies of the Broad-winged Hawk. Every year since the first World Migratory Bird Day in 2006, activities such as media events, bird watching and educational classes have taken place across Argentina. For example, in 2009 bird watching and awareness-raising activities for schools were held through the Birds of Mendoza Program and the Argentine Institute for Arid Zone Research of Cricyt. South America is the destination for many migratory birds that breed in the Arctic and across North America. Argentina is also the home to many endangered migratory birds such as the Peregrine Falcon. To become a part of this year's campaign, register your own activity for WMBD 2012 on this website! Celebrate the cultural, economic and environmental connections between Migratory Birds and People in your area and raise awareness about the need for their protection. For more ideas for your own WMBD 2012 activity browse through the other globally registered WMBD events which took place in 2011, 2010, 2009, 2008, 2007 and 2006!